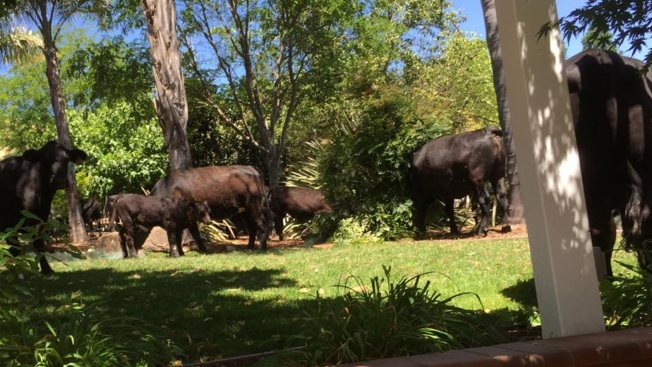 It’s not a sight she expected — or wanted — to see, but a Morgan Hill resident came face-to-face with roughly 60 full grown cows grazing in her backyard Tuesday. The cows busted a hole through Cheryl Ajluni's fence and destroyed her beloved landscape fixtures. The resident also said that she suffered damage to the yard's grass, fruit trees and plants. A Morgan Hill police officer and the resident’s mother helped chase away the animals, Ajluni said. "Thank God for insurance," Ajluni wrote on Facebook. "The mess in my yard is heartbreaking."